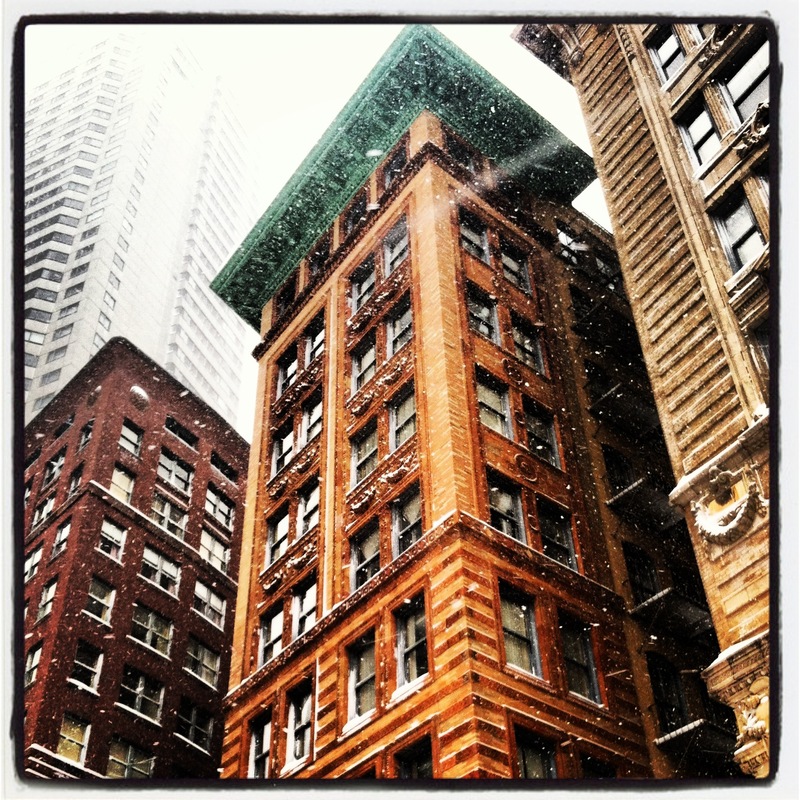 The Blizzard in Boston. | An Armchair Academic. The blizzard here ended yesterday in the early afternoon. Heavy snow fell for about eighteen hours, with savage winds throughout and for several hours after. At the peak, we had about two or three inches of snow per hour, more than enough for true white-out conditions. Unfortunately, this heaviest snow came in the middle of the night. 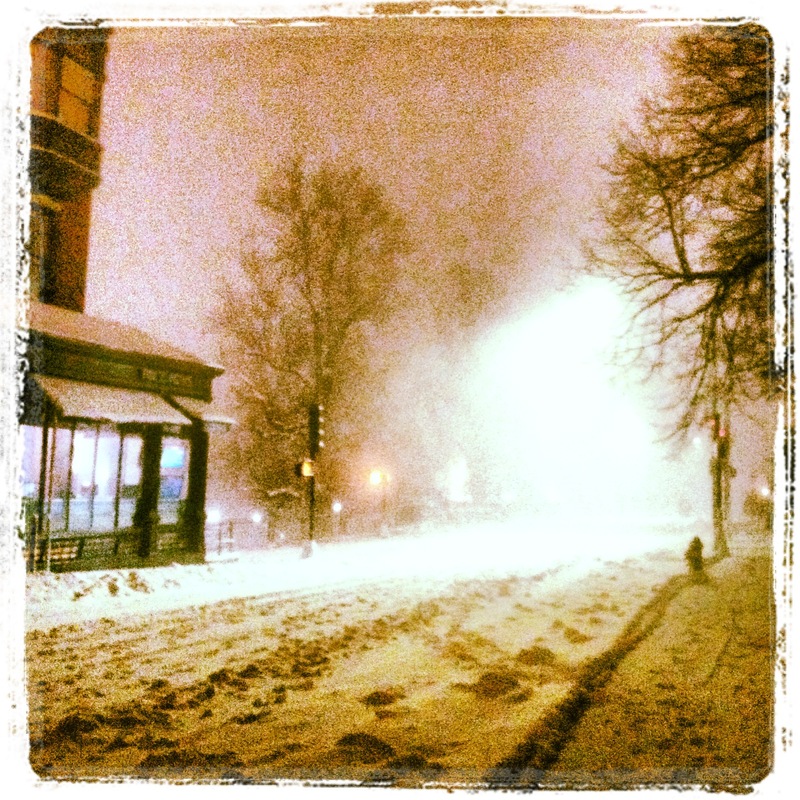 Beacon Street, about eight PM, early in the storm. The snow was beautiful but the wind gusts were truly painful. I left most of my winter gear in Vermont, so my trips out lasted only about fifteen minutes, then I had to retreat inside. About 400,000 people in Massachusetts lost power, but in Boston the lights stayed on. 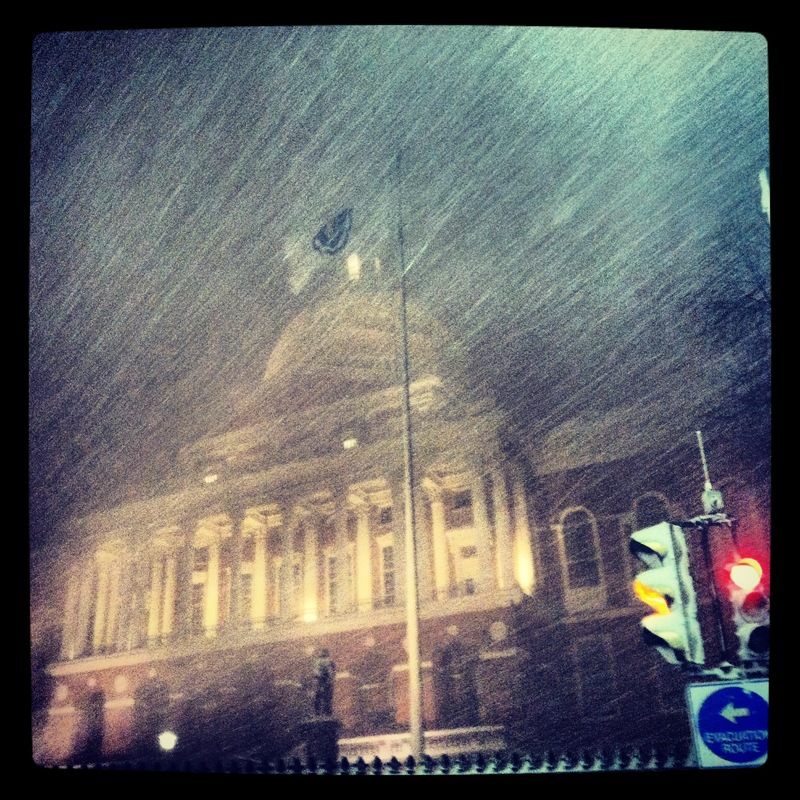 The state house, near midnight. The winds were painful. We had about two feet of snow. This is not too much, but of course there’s no place to put snow in a city, so it was enough to shut everything down for the last thirty-six hours. 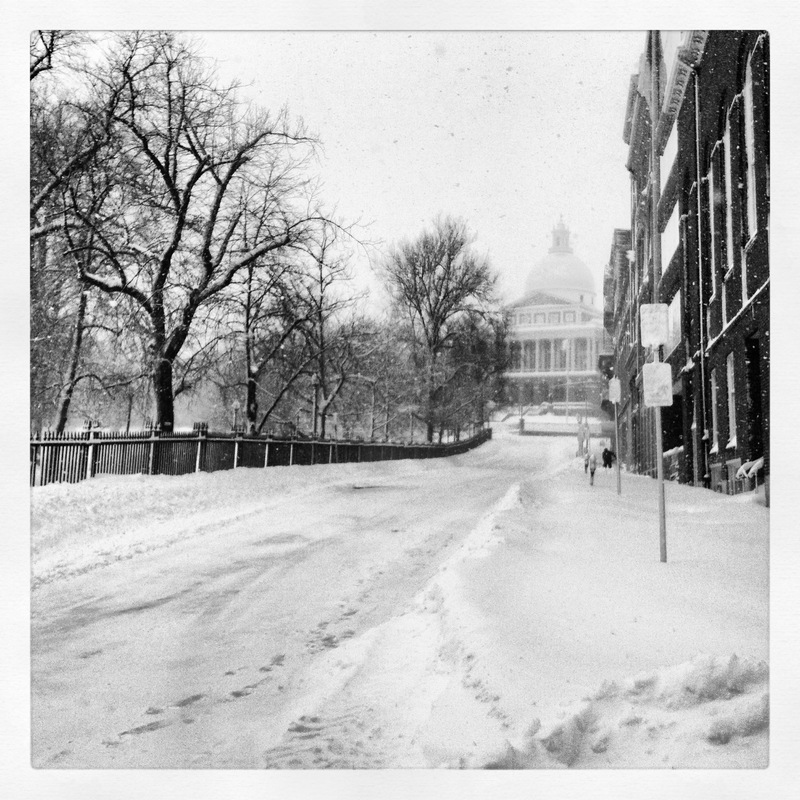 Yesterday the roads remained coated, with occasional police cars and plows cutting through. In the morning very few people went out, wandering with their dogs through the middle of the city’s largest streets. 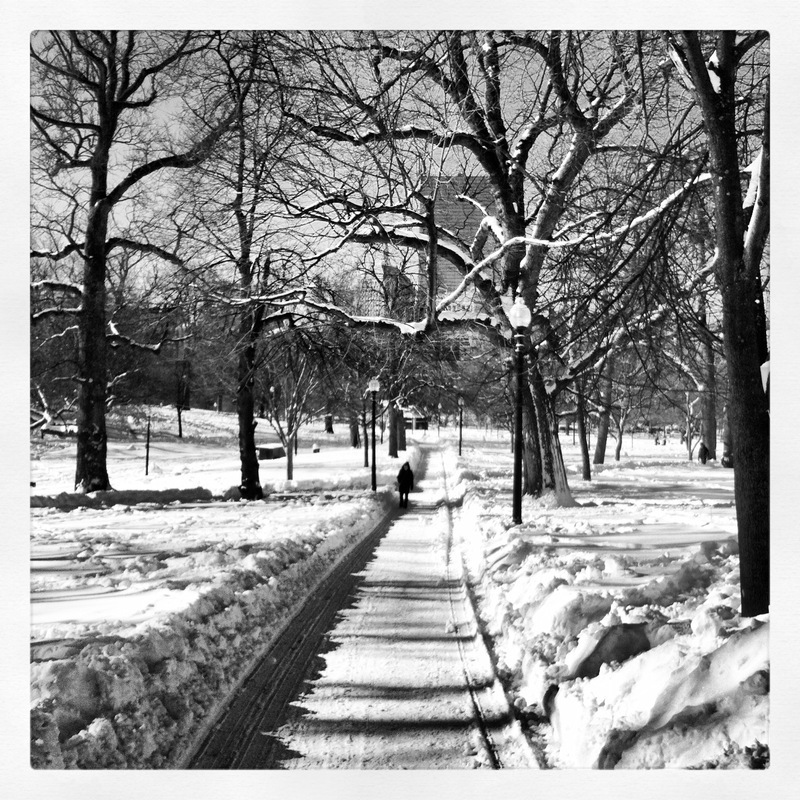 By the afternoon, there were some skiers and sledders on Boston Common. Everything was quiet, incredibly quiet for a city. Plows rumbled around, but with snow everywhere even their noise was soft and muffled. In the morning after the storm. Light snow and high wind as the storm ended. Nearly everything remained closed yesterday—an idea I endorsed in an earlier post—and the few coffee shops and bars to open were packed. The state-wide driving ban was lifted in the late afternoon. Today things begin returning to normal: blue sky, work crews chipping away at ice, trucks hauling mounds of snow, shops opening, and it’s no longer safe to stand in the middle of the street taking pictures. It was a good storm. 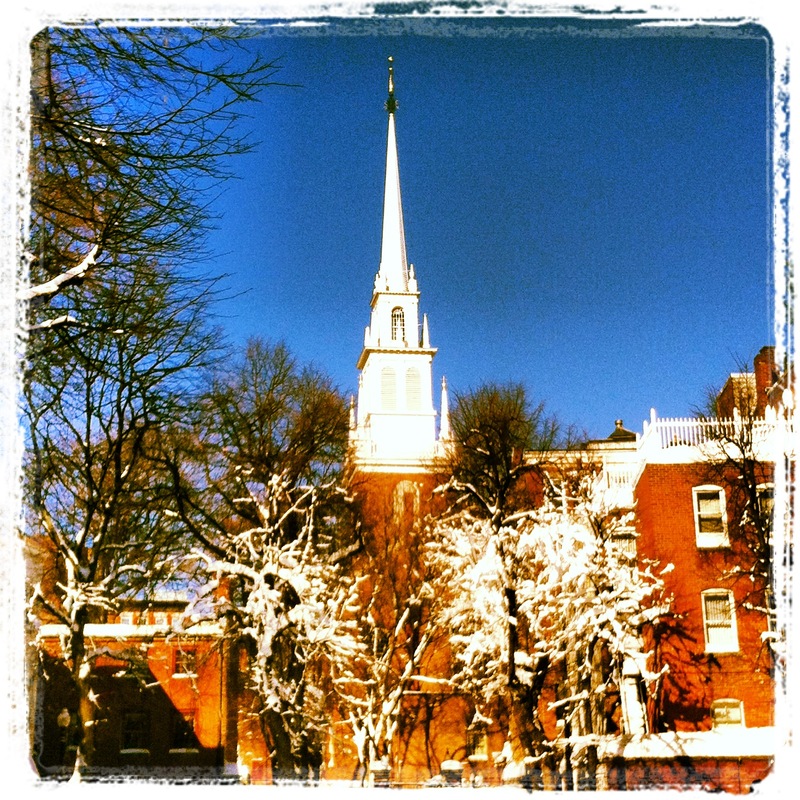 Old North Church. The blue sky has returned. I love the description of the muffled quietness. The main thing about our era they’ll need to remember when making historical movies fifty years from now is that we always had the sound of car engines everywhere. The sounds of a city change so much over time. In the early nineteenth century, the antiquarian John Fanning Watson gathered living memories of eighteenth-century Philadelphia, and wrote with wonder of how much quieter it had been before the streets downtown were cobblestoned and carts began to clatter. One old resident reported having sometimes been able to make out the songs being sung by a man at work—a slave, I think, chopping wood—a mile upriver on the far, New Jersey side of the Delaware.